Ron Hardy is the only man who can test Frankie Knuckles' status as the godfather of Chicago house music. Hardy was the major name for Chicago dance music from the late '70s to the mid-'80s. By 1974, he had already effected a continuous music mix with reel-to-reel machines plus a dual-turntable setup at the club Den One. Several years later, Hardy played with Knuckles at a club called The Warehouse and though he spent several years in Los Angeles, he later returned to Chicago to open his own club, the Music Box. While Knuckles was translating disco and the emerging house music to a straight, southside audience at the Power Plant, Hardy's 72-hour mix sessions and flamboyant party lifestyle fit in well with the uptown, mostly gay audience at the Music Box. A roll-call of major Chicago producers including Marshall Jefferson, Larry Heard, Adonis, Phuture's DJ Pierre and Chip E all debuted their compositions by pressing up acetates or reel-to-reel copies for Hardy to play during the mid-'80s. 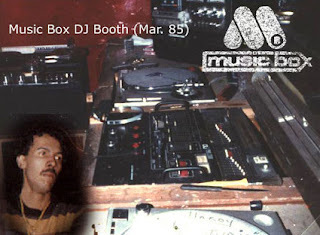 Lingering problems with heroin addiction forced him to leave the Music Box around 1986 and though he continued to DJ around the area, Hardy wasn't around when Chicago became house music's mecca later in the decade. He died in 1991. Deejay Ron Hardy died in 1991, and that's the only reason why he's not a star today. With the clubs he's been spinning for (especially the Music Box from 1983 to 1988), he was drawing the way of the new sounds of the night. Something was definitely changing, and he was part of the change. You know that one day 'Jack Has a Groove'... but did you really know when late Disco turned into early House music? Ron Hardy was it. Icon of the gay House nights of Chicago, that man was a deejay like some others are monk... it was everything for him, a sort of religion. Mixing speedy electro-pop with accelerated disco, edited disco-classics with acid tracks, when other deejays used to mix it warm... he used to mix it cold. One of his very close friends told me that he was almost never sleeping... mixing records all the time, doing weird things with his turntables. There was about nothing in his apartment, nothing but black shiny records, and a bed... and that for years since the 70's when he left for westcoast, the 80's when he came back to Chicago, until 91 when everything stopped. Too much drugs and awaken nights... he killed his own batteries for the music. At least we still have the tapes of his talent and the memories of his friends.